So I have sent out 3 mailers so far, about 100 each mailing, the first 2 that I sent out, I followed the program to the letter, offering $500 in my first mailer, yielded 5 total responses, but all 5 were insulted by my offer and would not consider even talking to me further. No problem. Today I just received my first phone call from my second mailer and I got the same result, another mad person on the line. The second mailer I offered $1000, not $500. So I am anticipating the same general responses from my second mailer. So on my 3rd mailer that went out this week, I tweaked the offer letter to an open offer format. So I did not input a offer price but essentially left the field open to try to solicit an offer price from them. Just thought I would throw this out to the group and see what you all think, or if any of you have any advice or experience doing something different. I will post about the response I get from the open offer letter format mailer. Any feedback is appreciated! Thanks! So you are offering to buy at their number? Sounds like a colossal waste of time. Think you need to send out more offers at the lower numbers. Maybe target lower appraisal value properties. I’m just a beginner but can’t imagine opening up negotiations with 100 people when I am looking to buy way below market. I would want to be weeding through them as fast as possible to get that one who just signs the low ball offer and sends it back. If some others call too great! I did something similar on some mailings I did before I got into the Landacademy. I bought some land and the response rate is much higher, but the higher response rate isn’t necessarily a good thing. I was more of a land appraiser than a land buyer. I wasted a lot of time interacting with people that probably had no intention of selling. I would recommend that you follow the program (it’s a proven formula) and make solid offers that will make you money but that are also appealing and fair to the sellers we target. Let your mailer weed out the tire kickers and save yourself tons of time. Thanks for the input guys, i really appreciate your feedback! Another newbie here with my thoughts. if there is something wrong with your list or mailing or your offer or if it’s just a fluke that you didn’t get a deal from that 100. Send a bigger mailing before you decide it didn’t work. to do your research on what the correct offer price is for your area and then you can send out letters with purchase contracts. I think there are positives to a generalized “I want to buy your land letter”. quite well with it, but yes it’s time consuming. looking for retail, we are not the buyer for you. When I first heard about the strategy of sending out blind offers, my initial impression was that it would allow me to avoid all the time-wasting conversations with sellers and just cut to the chase by managing the flow of accepted offers in the mail (I guess I expected a lot of them to just sign the agreement and send it back to me without any questions – which was apparently naive of me). I was surprised to see that most of these deals still require a conversation with the seller (just like a postcard without an offer would). Even so, I suppose one big benefit with a blind offer is that even though it may require a phone conversation, it still allows you to peg your offer at a very low price from the outset. Before they even call you, they’ll already know what your expectations are, and the “sticker shock” will already be over (rather than offending them AFTER you’ve wasted an hour talking with them and researching their property). Given that we’re going to hear the word “No” A LOT in this business, I like how this allows us to get to this point ASAP, rather than hearing it after you’ve dumped a ton of time into it. I like how this approach allows us to stop playing games with the seller. They’re never going to have any false expectations, because we already blasted out of the gate with our number and they can respond however they want (and whatever their response is, it isn’t going to cost me any time until I know they’re motivated and interested). That’s a pretty big PLUS in the grand scheme of things. I’ve used a similar approach with my website for the past few years. 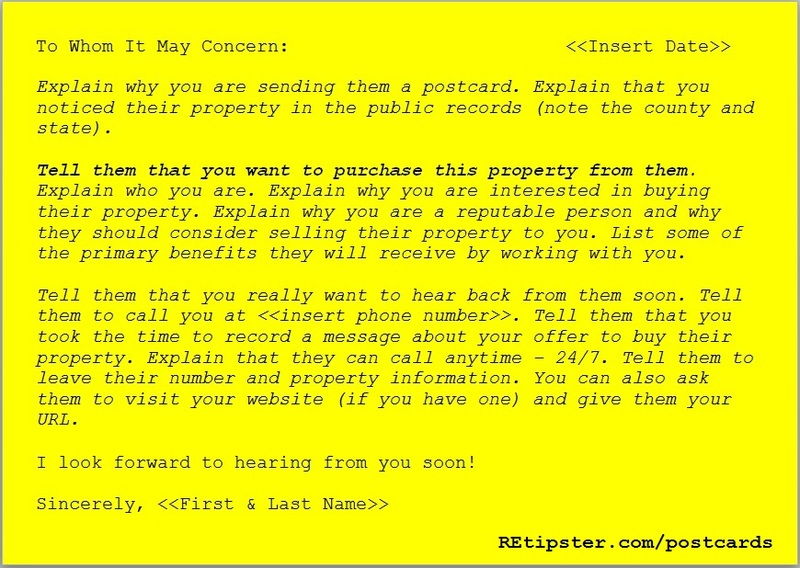 The postcard sends them to my URL, they submit their information, I look at their supposed “market value” and respond with my offer price of 10% – 30% of their number (this takes about 30 seconds for me to type and send). Depending on how they respond, the deal can either move forward or stop right there. It’s just a different way to send a blind offer, and it almost never requires a phone call. Granted, I can see how some sellers may be less trusting of a negotiation that relies solely on email (so this may be a down side to my approach), but it does still work in many situations. I’ve closed a ton of deals this way. As with anything, there are pros and cons to both approaches. So how about the sell side? That is all my calls the last week. Seems like a lot of hot leads that die out on me wasting my time. Wondering if I could put a 10% discount to buy it now no questions asked button/choice on my website? Anybody ever try those kinds of offers? We try to keep the purchase simple why not the sell too. Are you only sending postcards that direct to your website now? Do you still direct any of them to your phone? Hi @diego79 – when I do send out direct mail campaigns, I give them the option of contacting me via the website OR via phone. Most people opt for the website, but even when people do call me, my voicemail is now set up in a way that strongly encourages them to submit their information to me through my website. For those who do prefer the phone, this usually works to get the information in the format I want it… and for the few who still insist on leaving a voicemail, I just call them back the old fashioned way (as long as it’s only a few people, it’s not a big deal). I don’t know what’s in the academy yet so I have a question, why change what I assume is taught in the program? Does Steve or Jill send blind offers? I’m coming from the house wholesaler perspective and “low ball” offers are par for the course as well as angry responses. People seem to need to call and yell instead of throwing my postcard away! Strange. I guess why tweak if you are just beginning. Btw, sending out 100 DM pieces is such a small sampling, you can’t base anything of that. My 2cents. @jegreen I sent out about 500 offers to an area for about $200 an acre and didn’t get any deals. It turns out it’s way too low for the area. My next mailing which I’m fielding the calls from now, I did an open offer, “I want to buy your land” mailing. I did this to learn about the area a bit more, talk to sellers and get a little more experience. Yes, it takes more time to field calls this way and it’s not as efficient but I think the end result will still be the same. I don’t think I would continue to send open offer mailers but minimally it’s a good way to learn and also make sure you’re making the correct offer amounts. Glad my question has sparked a good conversation. As far as changing what is taught in the program, I don’t think it’s ever a bad idea to try new things to see if something else may work or not. More than one way to do things, or like Chris said to gain a little perspective into a market. As far as the number of mailers, it is what it is. Of course you are going to have the possibility of more responses from a large number of mail sent, but I have had a fairly good response rate from my “small” samplings, I have even had 3 people take the time to send the purchase agreement back to me with a starting offer , which has opened the door for me making my offer. Each mailing i have received 7-10% response rate from them up to this point. I have been able to get my feet wet and have made 2 solid offers which are still be talked about. Well anyways, thank you for all the feedback. this is exactly what this forum is all about. @adam Osterbur, did any deals come from that open offer strategy yet? No. not yet, I have made 2 offers, one was not accepted and just made another offer today, the gentlemen wanted to talk about it with his wife, so ??. In the end I feel like it is just a different way to arrive at the same location. Certainly nothing revolutionary, worth a try. It has given me an opportunity to actually talk more with these people, I have learned A LOT about some of the locations I am focusing on and have got a good idea of what people are expecting out of there land, what they paid for it. This will help me in future mailings in these areas trying to make a more attractive offer. @adam Osterbur what was the resale value of the areas you mailed to? Ive been having trouble understanding this, for Offers at $500 does one need to target a county or size parcel where $500 is 30% of resale value?